Yes... I cheated. Yesterday I gave in and drank a cup of coffee and you know what, it was amazing. I made my own creamer using date paste and coconut milk (although it was wayyy too liquidy... I will use less hot water for the date paste making next time) and drank a cup around 12:30 pm and for the rest of the afternoon I cleaned, did laundry, went shopping and cooked (beefy mexi cauli rice, avocado dressing, and omelet muffins) and felt motivated and content all at the same time. I had been feeling blah the past few days (sometimes borderline depressed) had less energy, and my brain didn't feel as sharp... I felt slower. I feel like I gave it a good shot. 14 days without coffee is a long time for me. And it's not like I was ever a heavy coffee drinker or needed it multiple times a day. Just one cup in the AM and I'm good to go. I'm sorry I couldn't make it the whole 21 days, but I'm really not. I think there's worse things I could have cheated with. I haven't touched a piece of cheese or dark chocolate or had a glass of wine in two weeks. I went to Sonoma Chicken Coop last Friday and my friends ordered the chocolate fondue plate (which looked soooo good) and fries and beer while I ate my half chicken plus extra grilled veggies and lemon water. 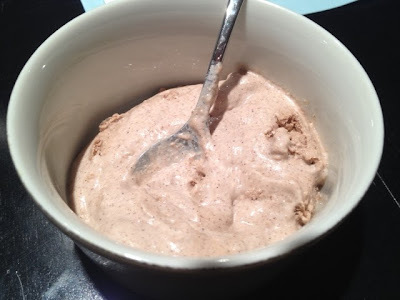 Tangent: Someone had the great idea of freezing the banana nut porridge and turning it into ice cream. It was amazing a few hours after putting it in the freezer, but today it's rock solid... Next time I'll separate it into separate containers and thaw a little bit at a time. I went to Crossfit at 6am today. Go me! Hopefully I can keep this up!